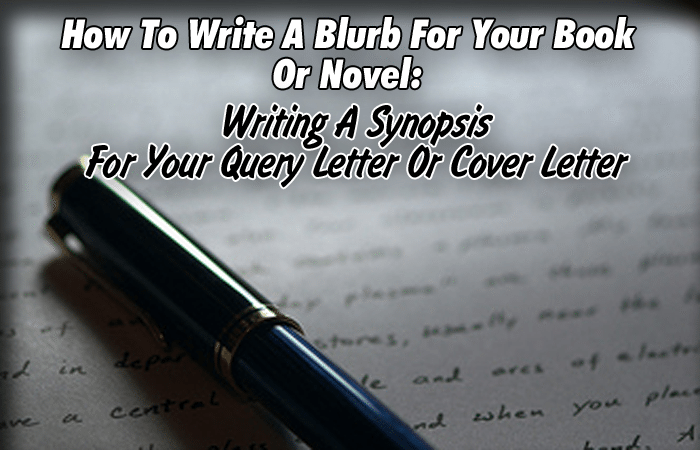 How To Write A Blurb For Your Book Or Novel; Writing A Synopsis For Your Query Letter Or Cover Letter - Writer's Relief, Inc.
What is a book blurb? A blurb is a short summation of your nonfiction book or novel to help readers decide if they want to invest the time in reading it. The blurb can also be a sentence or two of glowing praise written by a fellow author to help market your book, but for this article we’ll focus on the copy that appears on the back cover of a book. A blurb in a query letter is much like a short synopsis—you have approximately 250 words in which to summarize your book in a concise, engaging package. And before you panic, you should know that traditional publishers have editorial staff to write blurbs for you. But if you’re self-publishing or need to write a blurb for promotional purposes, such as for your Web site, that’s cause for celebration not panic—you have something to blurb about! Your task is to give potential readers an enticing peek into the nature of your book and leave them wanting more. Here’s how to write a book blurb. 1. If you’re self-publishing, carefully follow the publisher’s guidelines for length and other necessary information. You may also want to study samples of blurbs on other books they’ve published. The average length of a blurb is between 100 and 250 words. You don’t have much wiggle room, and the blurb is no place to try to cover the entire plot. Make each word count. 2. Identify your audience. If you’ve written a book of poetry, sum up the general flavor or tone of your work—it could be “a dark collection of soul-wrenching prose,” or perhaps your poems focus on relationships or nature or Southwest culture. Either way, potential readers will want to know what they’re getting into. If your book is an action-packed adventure, you’ll want to focus on the major plot points. And a blurb for a romantic saga with a dashing hero should focus on the element of romance and the heroic character rather than the plot itself, unless the plot is as strong as the element of romance. The setting can also be a crucial detail to include if it is central to your book. 3. Identify what makes your book unique. If your book has a quirky take on a subject, convey this to your potential readers. Is it a true story or based on actual events? If your book is nonfiction, consider the benefits to the reader—does it offer something important and valuable? Impart unique wisdom? Use whatever hook you’ve got to engage readers. 4. Match the tone and style of your book to your blurb. If your book is humorous, make sure your blurb reflects that. A dark, ominous tone works well for a thriller but not necessarily for historical fiction. Once you’ve sketched out your blurb, check to make sure it’s clear, concise, and engaging. An unfocused, wordy blurb gives the impression that your writing will be more of the same. Test your summary out on fellow writers or friends and colleagues who haven’t read your book. You need their honest opinion. Specifically, does the blurb make them want to read more? If it does, you’ve accomplished your goal. Congratulations! Click here for more advanced book blurb writing techniques and tips. Still having trouble writing blurbs, cover letters, or query letters? Writer’s Relief can help with all aspects of submitting your writing for publication. Crime novelist Jack Colder’s trademark was an inventive storyline, but when he met the gorgeous, violet-eyed Dr. Colleen Baker, he had to make a decision with the plot… literary or cemetery. Thanks for the tips – the back blurb is proving to be a lot more difficult to write than I had expected. The book is an allegorical tale so I’m debating whether it’s better to write about what people can get out of the book, or to focus only on the story.